Finally after all these years they put the best show on DVD. I already had bootlegged copies on DVD but I bought this anyways because it's awesome and I had to support it. I remember getting up and taping these shows at 6:00am and be totally amazed at the detail and storyline. I think all generations should watch this series as it has a lot of life lessons as well as well as some very great anti racism speeches. I truly enjoyed this show when I was young and it was more than just a 'cartoon' as it was more serious and reflected a lot of society. There are a lot of noble characters that gave you something more realistic to look up to than superman or batman who were awesome but not realistic. 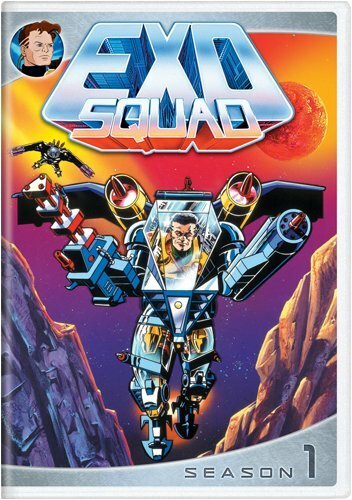 I'm an on line gamer and fiction writer, and had been researching fictional marine/fighter jock sources to get some background info; Exo Squad had been one option I chose to check out. I ordered the DVD of Season 1, and I vaguely remembered the show when it had aired in the early 90's. Cons: the animation colors were a horrendous 80's bright neon. I thought the arcing storyline would be better, more marine pilot oriented such as Starship Troopers meets Top Gun, and less frenetic jumping from plot point to plot point. This first season storyline is weak, and I wanted more marine/soldier oriented glimpses. Pros: the solders piloted Exo Robotic suits for space and ground combat - nothing wrong with the toys. Although I love science fiction, one of the things that bothers me about most is that they're almost always completely implausible and filled with nonsensical techno-babble. Although Exosquad does make use of some fairly fanciful technology like exoskeleton battle suits, fusion powered vehicles, and interplanetary colonies, they stay within the bounds of practical science. They're not traveling around the galaxy faster than the speed of light; it takes them weeks to travel between our solar system's planets. No aliens from other worlds either, mankind can is good enough at creating enemies for itself. The continuous story line with a defined beginning, middle, and end is another thing I love about this show. The story itself seems more similar to the reimagined Battlestar Galactica than the original Battlestar Galactica itself. My only gripe is that for a series so clearly created with older audiences in mind is that everything is so brightly colored, and there's no set uniform. This very G.I. Joe like aspect was clearly put in so that they could sell toys.